This book was written with a view to combining author’s pursuit of Hindustani music with her background in art journalism. 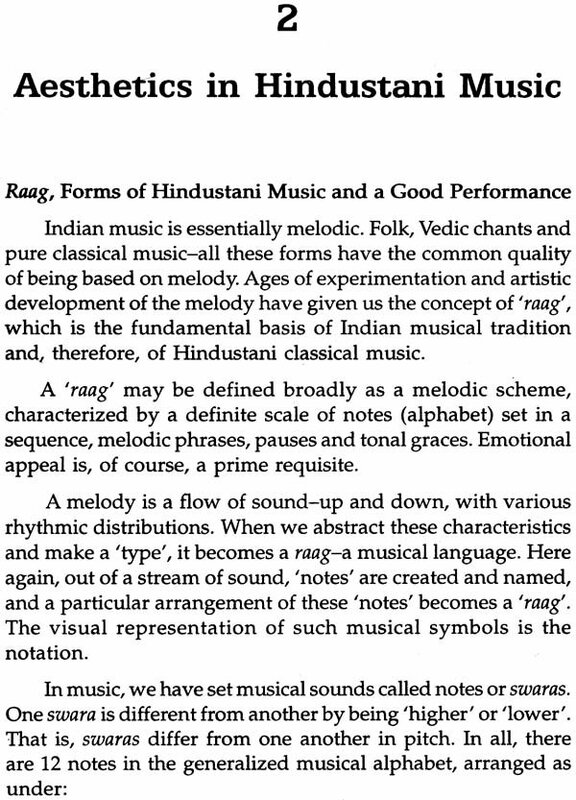 It begins with a brief description of some of the classical performing art-forms of India and then goes on to discuss in detail that what musicologists down the ages have called “good” music. Keeping within the format of focusing primarily of Hindustani music, the author traces, what the modern trends in this art form are and the reasons behind these trends. 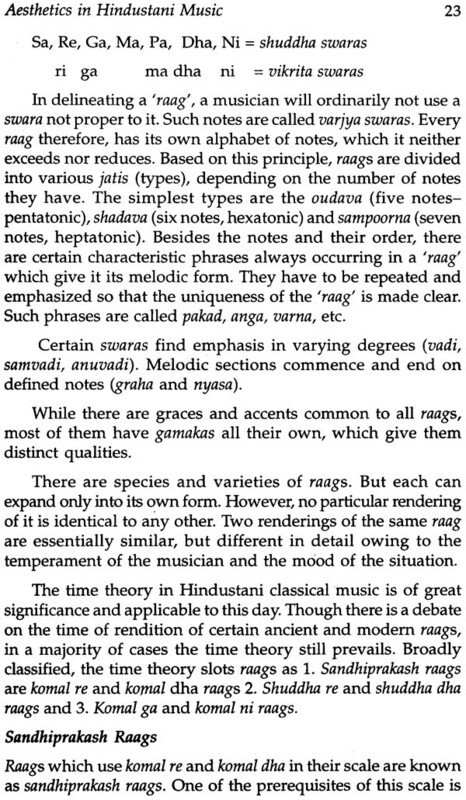 The fact that Hindustani classical music will always have an audience, although limited in number, and the reasons behind it, has been examined. And, against the backdrop of classical Indian music, dance and theatre in their current presentations , the author analyses what should be the role of the critic and their nature and style of criticism is. What is the critic? Does the critic serve any significant purpose-for the artiste, for the appreciation of the audience? Do the critics truly communicate aesthetic values? Above all, do they know enough to comment upon? These, and many other querries are being discussed in this book. Priya Kanungo, Brought up in a musical environment, from her childhood, and currently she is having training under Pundit Deepak Chatterjee. Priya has an M.A., M. Phil. and Ph. D in Hindustani Vocal Music from the Delhi University. Apart from her deep interest in music, has an Honours degree in Commerce from Lady Shriram College and worked as a journalist with The Economic Times, Hindustan Times, Business Standard and The Financial Express. The performing arts of India go back several centuries. It would be a mammoth and probably impossible task to describe all of them here. So, for practical purposes, only some of the popularly-known forms of the three broad streams of the performing arts – music, dance theatre-have been dealt with in this book. 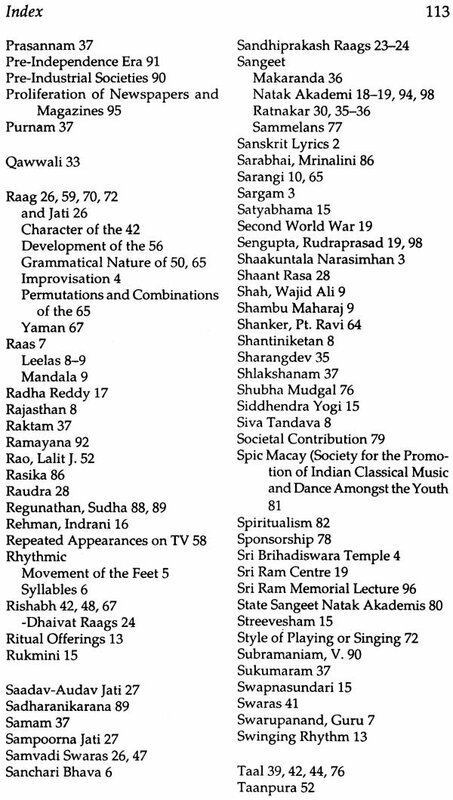 No wonder, Bharata’s Natya Shastra, which most consider the fountainhead of performing arts, gives equal weight to music, dance and theatre. After all, each of them is a combination of the three put together. Yet, it is difficult to speak of one tradition of communication through the arts, particularly the performing arts in India. In fact, there are traditions of performing arts, each with layers of complexities and often, borrowing from each other. In spite of these complexities, and the apparent picture of an eternal timelessness which is repetitive, a close look reveals that each of these classical forms can be clearly identified both in terms of the evolution of artistic from and style in time and it socio-cultural milieu in space. This book begins by giving a short description of some of the prime classical performing arts of the country in the first chapter Since the focus is on Hindustani music, the second chapter goes back in time to record some of the fundamental concepts of Hindustani music like raag and rasa, what well-known musicologists down he centuries have said as to what should be considered “good” music and then , what changes have occurred over time-whether they are structural and grammatical changes in Hindustani music or situational and dictated by time, economics, style and technology. In many ways, the introduction of microphone and the facility to record music had far-reaching effects on both practitioners and connoisseurs of music. For practitioners, this meant not having to strain their vocal chords to reach the farthest end of the auditorium, as also those with weak voices getting a chance to be “heard”. Recorded music meant not having to travel miles to listen to your favourite musician, but the luxury of sitting at home and experiencing that pleasure-not once but as many times as you choose. It also meant that music students can record a lesson and keep listening to it when needed instead of going over the same lesson with the guru several times. 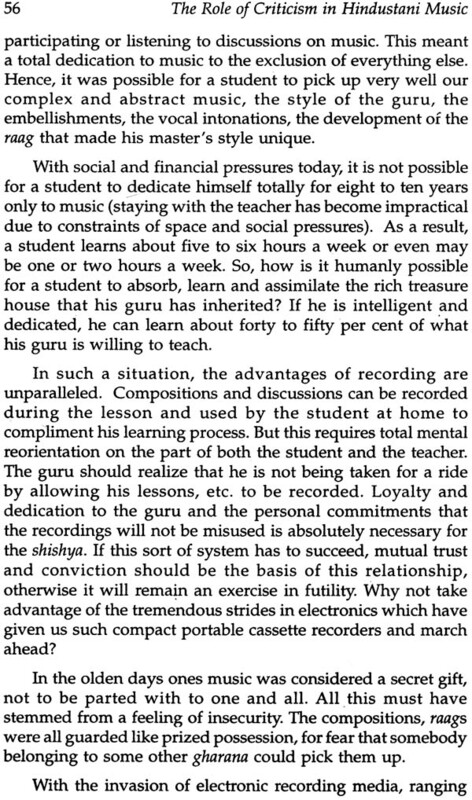 Being exposed to only one gharana as a student has since, not been a necessity. These, and many more modern trends have made a difference to face of Hindustani music over the years. Chapter three is, perhaps, the core of the book. This is where the subject of music criticism is addressed. Some critics when interviewed, said they don’t have much space now in newspapers to write reviews. It is a fact that most publications don’t entertain articles on the performing arts today-neither for projecting issues articles concerning the art world nor reviews of performances. 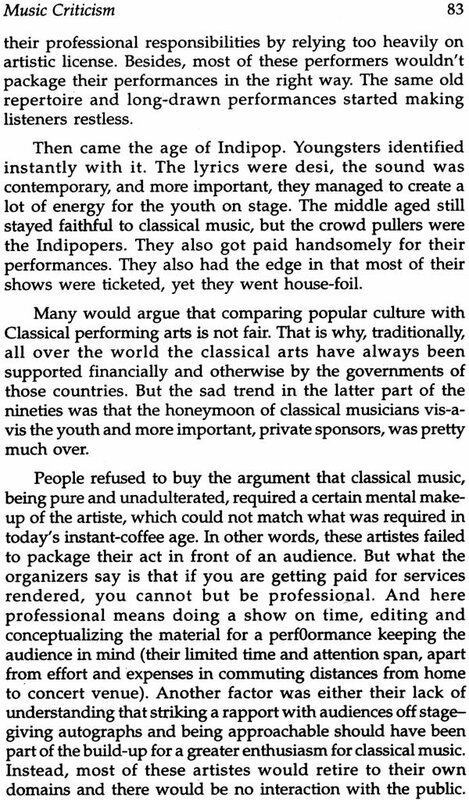 The explanation given is that people aren’t interested in the classical arts any more; that popular arts like Indipop, rock and jazz concerts are the crowd pullers. Therefore, most publishing houses (with the exception of The Hindu perhaps) believe that if people aren’t getting attracted to the classical performing arts, they certainly won’t be interested in reading about them in newspapers and magazines. At the most what we see today is curtain raisers and announcements of such programmers. Of course if there is a celebrity (who that particular journalist/photographer considers a “celebrity” read, you might have a bit thrown in about how “spectacular”, ”exquisite” or “fantastic” the performance was. About writing a knowledgeable yet critical review, some critics said that if a negative statement has been written about a performer, there have been instances where the performer has lashed back by saying : “You can’t sing/dance. Who are you to say anything negative about the performance?” It is true that what a critic writes about a star performer does not really affect his/her performers. But it is of great importance when it involves an upcoming artiste. It is kind of publicity-good or bad-but it is publicity nevertheless and getting “known” is important for a performing artiste. The book also looks at the caliber of critics in the country today. Many of the veterans had learnt music at some point in their lives. Somewhere along the way they might have realized they could be well-informed listeners rather than performers. That’s when they might have become critics. Then there are some among the critics who can’t recognize common raags. They are the ones who, among the group of writers in that particular newspaper/magazine, might have professed an interest in music and were therefore sent on the assignment of reviewing a concert. There are others too, who write long, flowery pieces, without touching upon a single technical aspect of the concert. You might wonder whether the article is a demonstration of the poetic acumen of the critic or an apology of a review. Many times it is a combination of the two, with the former dominating. The issue of patronage can’t be far away from criticism of performing arts. 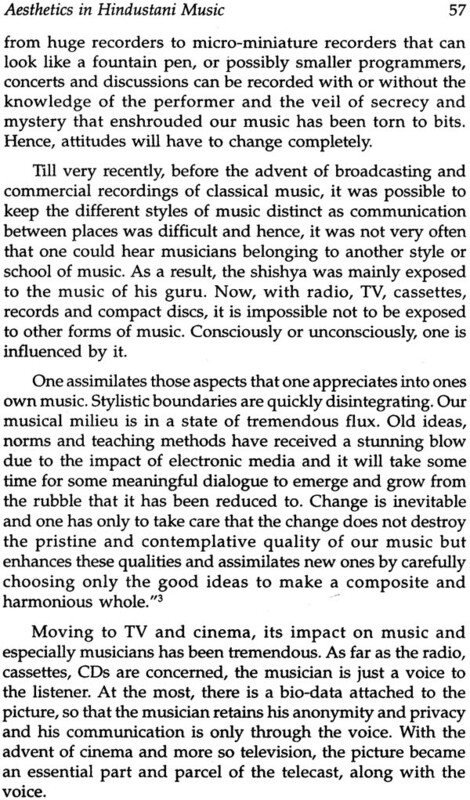 The question whether patrons of Hindustani music understand it critically needs to be answered. In India, the biggest patron of music and dance is the government. A bunch of officials, with a few “experts” thrown in, from various committees. They pick and choose the deserving artistes. It is important to note that on many of these occasions, the expert might be suggesting that artiste A or B should be given a chance not merely on the basis of merit. So, many times, the patron is the benefactor not basis of merit. So, many times, the patron is the benefactor not because he/she any critical knowledge of music. Then there are the corporate who patronize art. Some of them even run well-managed gurukuls like the Sangeet Research Academy in Kolkaata, which is funded and managed by ITC. However, most business houses lend their support from outside, by sponsoring a festival or an event. In such events, it is the star musicians who attract the crowds and some promising artistes are given warm-up acts, that is, they start the evening’s recital and after that performance a Pt. Jasraj, Pt. Bhimsen Joshi or Smt. Kishroi Amonkar takes center stage. During the process of compiling information about this book, it was observed that the ‘80s were, perhaps, the best time for classical music performances. That’s when both the government and the corporate sector extended their largesse to Hindustani classical music. 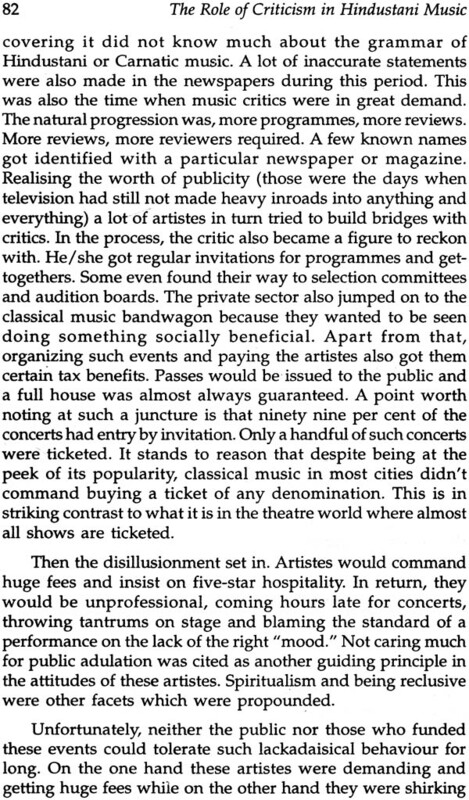 Some believe that the star performers who benefited greatly at this time didn’t really “package” themselves well, because of which audience interest in Hindustani music declined. Others feel it is the arrival of Indipop that proved comparatively more attractive and, therefore, took audiences away from classical music in the ‘90s. The fourth chapter of the book looks at issues concerning classical dance and theatre. Theatre bears the burden of beings probably the most difficult to sustain-the involvement of a large number of people who need to rehears for many weeks, costs involved, finding a common time, sets, and the lack of sponsors. On top of that, it is usually anti-establishment. The advent of supper theatre (largely English theatre) lent a certain glitziness, but this kind of five-star environment, with dinner thrown in as part of the ticket charges couldn’t sustain itself for long. We are now back to risque musicals in English, National School of Drama (NSD) productions and the once-in-a-while interesting, independent plays. Dance on the other hand is flouring, both in terms of the number of dancers increasing each year and, possibly, the number of opportunities to perform also increasing proportionately. But again, the space for dance criticism in publications in miniscule. And being a dance critic is a tall order. You have to know the intricacies of each of the dance forms, be it Bharat Natyam, Odissi, Kuchipudi etc. and follow the languages used so as to understand the songs that are sung as accompaniment to the dance. 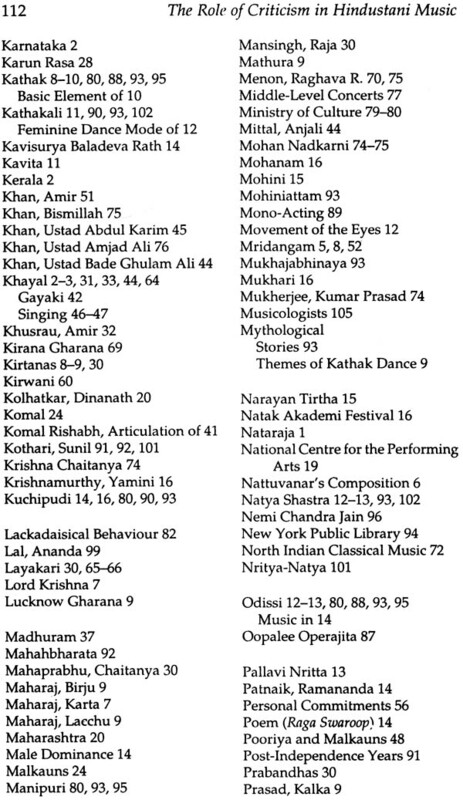 Conversely, it would be difficult to find a Bharat Natyam critic or an Odissi critic. There has also been an effort in the book to trace the role of music in both dance and theatre over the decades. The role of criticism n the performing arts is not restricted to just newspapers and magazines. An attempt has been made to see how it is represented on television, in universities and among intellectuals in seminars. The apex government body for the performing arts, the Sangeet Natak Akademi, is supposed to look for new talent, support dying art forms and hold seminars to address problems in these areas, apart from holding regular festivals. In fact, it is this body’s critical analysis that can make the maximum difference to any performing art or artiste. Unfortunately, the accusations against the Akademi far outweigh what they are credited for. When interviewed, most artistes agreed that constructive criticism has helped them on many occasion to see what they had overlooked. It was a good means for means for them to correct their flaws. But at other times, they felt that it was often meaningless and was said for the sake of saying something. It is for those who read or see (on TV) such criticism, perhaps, a useful medium for comparing notes and checking notes and checking whether their opinions (as the audience) tally with that of that of the critic (who is considered “informed” and knowledgeable in the field) and also for gathering more information on the subject.